Language, cognition, and memory are traditionally studied together prior to a researcher specializing in any one area. They are studied together initially because much of the development of one can affect the development of the others. Most books available now either tend to be extremely broad in the areas of all infant development including physical and social development, or specialize in cognitive development, language acquisition, or memory. Rarely do you find all three together, despite the fact that they all relate to each other. This volume consists of focused articles from the authoritative Encyclopedia of Infant and Early Childood Development, and specifically targets the ages 0-3. Providing summary overviews of basic and cutting edge research, coverage includes attention, assessment, bilingualism, categorization skills, critical periods, learning disabilities, reasoning, speech development, etc. 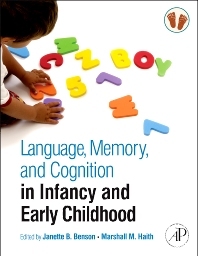 This collection of articles provides an essential, affordable reference for researchers, graduate students, and clinicians interested in cognitive development, language development, and memory, as well as those developmental psychologists interested in all aspects of development. Researchers interested in cognitive development, language development, and memory, as well as developmental psychologists interested in all aspects of development.